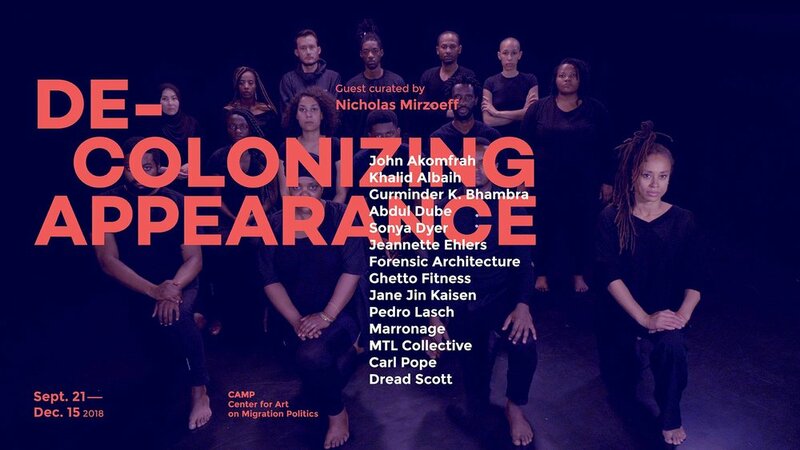 Week 38: New exhibition, "Decolonizing Appearance"
Join us this week for Trampoline House’s new exhibition, “Decolonizing Appearance” at CAMP! This Friday from 6 pm–12 am Trampoline House will reveal it's new exhibition, "Decolonizing Appearance" in CAMP. Come and hear guest curator Nicholas Mirzoeff talk about his ideas behind the exhibition. There will also be artist talks by Copenhagen and Aarhus-based artists Khalid Wad Albaih, Abdul Dube, and Jeannette Ehlers, who have contributed to the exhibition. The evening is concluded with community dinner in Trampoline House and a dance party. All welcome, you can read more here! Join us on Sunday between 1 pm–5 pm for the "Decolonizing Assembly". Here we will be thinking about many things, such as what decolonization looks like, how the colonized and the colonizer appear to each other, and how the colonized have the right to look, be seen and to appear. Don't miss the chance to part of this important discussion! All welcome, you can read more here! This Friday from 4 pm–6 pm Women's Class will receive a special presentation by psychologist Sólveig Gunnarsdóttir from the Danish Red Cross. Here she will discuss raising a refugee child in the Danish asylum or integration system. All women welcome, you can read more here! This week at Trampoline house we will have a decolonial banner workshop in preparation of the exhibition this Friday. Please feel free to join on Tuesday 1–4 pm, Wednesday 2–5 pm and Thursday 2–5 pm. Join us this Wednesday at 12–4 pm for the Women's Club excursion to Meyer's kitchen! Here we will learn about professional kitchen rules, kitchen organisation, garbage handling, low fat cooking and much more. All women welcome! Newer PostWeek 39: New Children's School! Older PostWeek 37: "Sea of Sorrow, Sea of Hope"